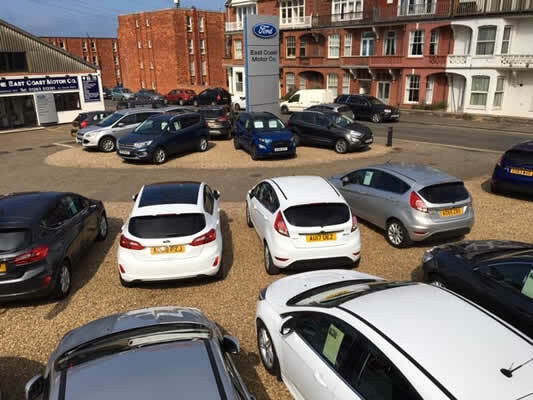 The East Coast Motor Company, also known as Cromer Motors, has been in business in the seaside town of Cromer since 1919, and is the only authorised Ford Dealership for sales and service in the North Norfolk area. It is still a family run business, and is managed by Adam Rounce who is the fourth generation in the business; his father George obtained the Ford franchise in 1967. Graham Poulter now manages the Car Sales department. There is a friendly, non-pressurised atmosphere in the new car showroom and on the used car forecourt. We offer very competitive new and used car deals to suit all requirements. All our used cars have been carefully selected and prepared to our high standards; the majority are Fords with low mileages and a full service history. Our nearly new Fords have large savings over new cars. If we have not got in stock the car of your choice we will endeavour to find one to satisfy your needs. We are able to carry out whatever service or repair your car may need, and offer an efficient, fast and reliable service package. This department is run by Kevin Muirhead. We employ Ford-trained technicians and are equipped with the latest Ford diagnostic equipment. We also service, MOT and maintain most other makes of vehicle. Our reputation as a Garage which offers real service and value for money remains with us after over 90 years in business. So, whatever your motoring needs, call in for a professional, personal and friendly service that only a long established family run business can offer. If you wish to contact us, you can call us using the number which is always shown at the top of the page, or comlete the form on the Contact Us page.